Added new layout to Todo-list page and customizable skins. Adding today's total time (hr and min) to monthly stats. Increased number of labels to categorize tasks. Fixed graphical issue on Month Details page. Fix on Unplanned and Urgent row position. Removed duplicated calls to check new versions. Added links to Social Media. Fix Popup Menu position for Help button. Updated URLs to How To web pages. Max window width enlarged to show all buttons. Fix on fresh install (thanks to MiRxx for reporting this). Score position restored to the right-hand side. Fix: timer can't be started on completed tasks. Executable reduced in size. Some skins were removed. Scores and Task Descriptions are swapped. Enlarged field in ID dialog. Automatic char format conversion of lic file. Reworded text messages to the user. Fix: display ID with F9. Fix: items shouldn't be moved from Activity Inventory to ToDo page when in read-only mode. Fix: display Chinese characters on Last Day page (thanks to Iris). Fix: Crossing the midnight the app will be closed on adding/removing scores or starting the timer. Fix: copy all files when Userdata folder is changed. Fix bug: app crashes at the beginning of the month. Fix on Score details, thanks to Todd M.
Added page: what I did last day? Fix: close and reopen => recursive completed tsk are not stroke-through anymore! 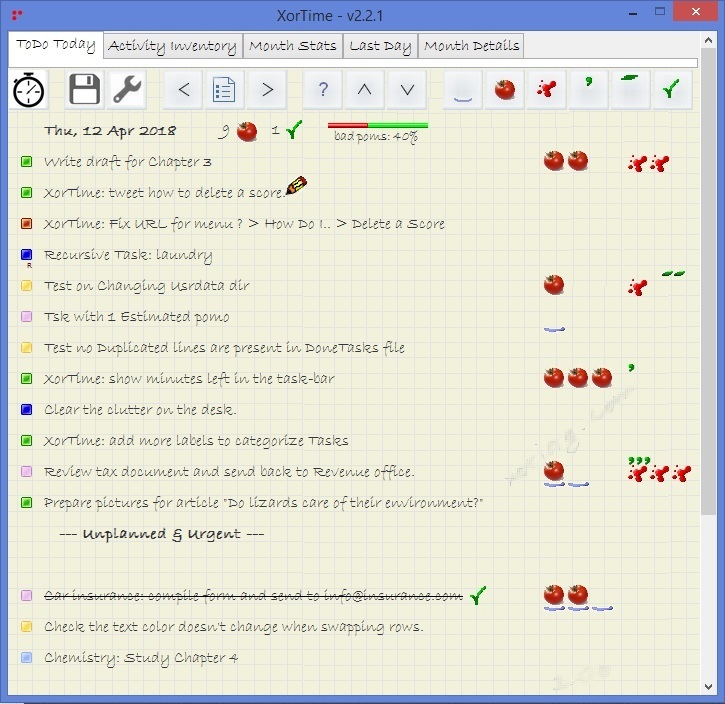 Added Hot-Keys for task labeling - Alt+R: red, Alt+Y: yellow, ..
New button to sort tasks. First undone and then completed tasks. New feature to move a task from the Inventory List to the To-do-today page.